Traditional Chinese Medicine (TCM) has many different healing modalities. In this article, we will discuss four of the most common healing modalities: Acupuncture, Tui Na, Nutrition Therapy, and Herbal Medicine. Acupuncture- Acupuncture is the most common modality of Traditional Chinese Medicine practiced. It involves interesting small needles at various points throughout the body, called jingluo (meridians). The meridians, also called acupoints, are the channels of the body where qi or vital-energy flows from. Qi flows from the body's zang-fu organs to the body’s framework of the bones, tendons, muscles and skin. As long as qi flows freely, the body will remain balanced and in good health. However, if the flow of qi becomes unbalanced, the body will become ill. Different imbalances result in different illnesses. In order to determine which imbalance is at hand, acupuncture physicians will examine a variety of symptoms, such as breathing pattern, skin dryness, and tongue coloration. 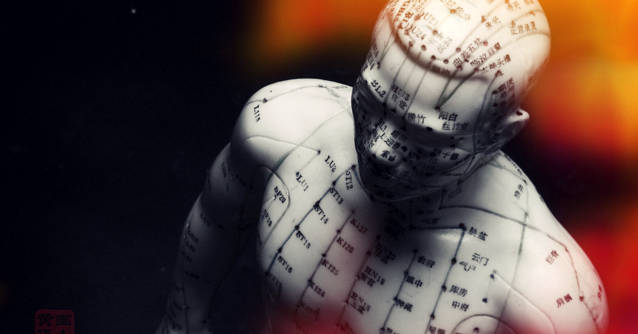 After determining which meridians are blocked, based on a patient’s symptoms, the acupuncturist will insert needles into the blocked meridians to restore qi circulation. Once proper qi circulation is restored, the body can heal from the rest of its illness through proper care and through the aid of the other TCM modalities. Because proper qi circulation is extremely vital to good health, acupuncture is usually the first medical procedure that patients undergo. Tui na-Tui na is a form of Chinese massage therapy that incorporates hands-on techniques to balance yin and yang by massaging the different acupuncture points across the body. Its main techniques are deep rubbing, joint manipulation, compression, vibration and pinching. It is especially helpful for treating muscular injuries, as the flow of yang can improve flexibility, blood circulation, and can even soften hard parts of the body, such as scar tissue. Like acupuncture, it is also good for providing pain relief, which makes it popular with athletes. Additionally, it is very useful for relieving stress and can be used to help manage anxiety disorders. 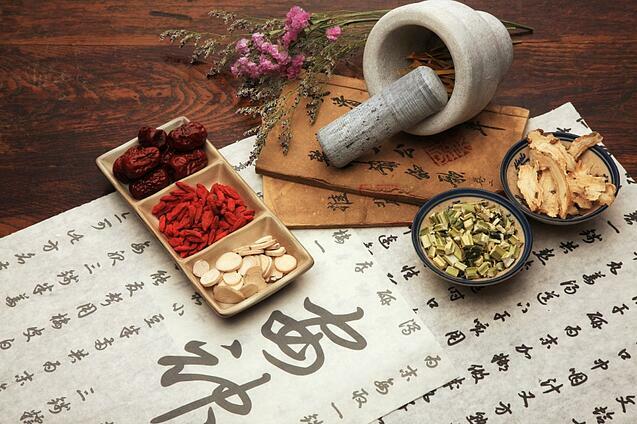 Herbal Therapy-Traditional Chinese Medicine utilizes a large variety of herbs and natural remedies as medicine. These remedies include plants, minerals, animal/insect parts, fungi, and other kinds of supplementation. Acrid-Aids the lungs and stimulates moisture production. Sweet-Aids the spleen, particularly with digestion and is associated with calming properties and producing fluids. Sour-Aids the liver's functions and has moistening and softening affects, particularly when it comes to tendons and ligaments. It also help reabsorb fluids that have left the body dampness. Bitter-Aids the heart and has heat-removing properties, such as drying. Salty-Aids the kidneys and has properties of dryness, which can help in removing moisture and softening hardness. 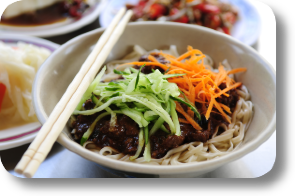 Nutrition Therapy- Traditional Chinese Medicine classifies food according to its effects on yin and yang balance. Yang energy is responsible for warming and activating bodily functions. Symptoms of a yang deficiency can include cold hands and lower back pain. Yin energy is responsible for cooling and moistening. Symptoms of a yin deficiency include night sweats and heat flashes. Good nutrition should help balance the body’s yin-yang through the Five Flavors. For example, if you have a yin deficiency, you should eat foods that increase yin in your body, such as beef and pork, which are sweet and warm. The right diet will vary from person to person, and from season to season, since the weather can affect the yin-yang balance in the body. Moxibustion-A form of heat therapy, where a bundle of dried herbs (moxa) is burned near the surface of the skin. The warmth from the bundle is to stimulate the flow of qi in the body. Cupping-A form of heat therapy in which heated cups are applied to the skin at meridian points to stimulate qi. Qigong-A form of exercise therapy that combines meditative, static, and dynamic body movements to balance the flow of qi. In the following weeks, we'll discuss the different modalities in greater detail. If you're interested in learning more about a career in acupuncture, then download our free guide below. Our school is located in Miami, FL.